Some questions for discussion on Eric Metaxas’ chapter on George Washington. 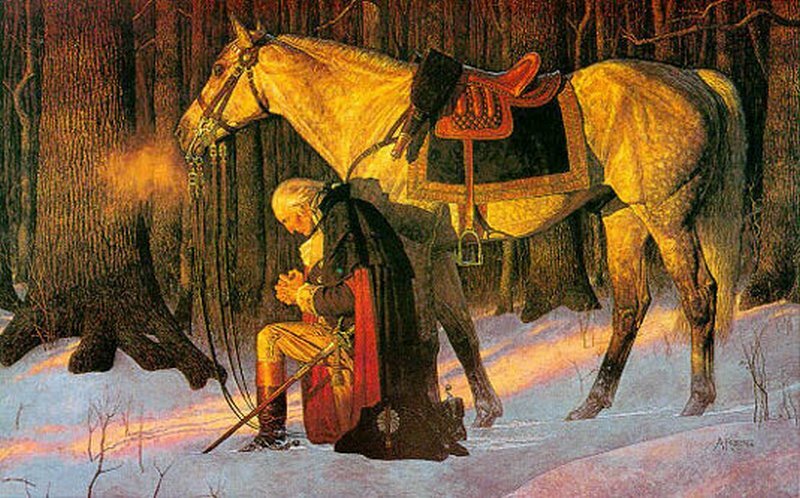 Metaxas says, “If you wonder whether one person’s actions can matter, and if you wonder whether character matters, you needn’t look any further than the story of George Washington.” Later he states that Washington believed God had a purpose for his life. Do you ever wonder about this? Can one person’s action matter? Does God have a purpose for everyone’s life? How might that knowledge change a person? What’s God’s purpose for your life? How would you characterize Washington in his first military experience in Western Pennsylvania (in the early days of The French and Indian War)? What kinds of character traits do you observe? Throughout the remainder of the war, what do you see developing in Washington? In his letter to George Fairfax, Washington speaks of the dichotomy before him: Engaging in a bloody revolution or becoming a nation of slaves to England. He goes on to write, “Sad alternative! But can a virtuous Man hesitate in his choice?” Have you ever been in a position where you only had two options — and neither was desirable? Upon what did Washington apparently base his decision on these two alternatives? How do leaders in your life compare to this statement about Washington: He seems discreet and virtuous, no harum-scarum, ranting, swearing fellow, but sober, steady, and calm. Why would anyone not strive to be like this? According to Washington’s nephew, how often did Washington read his Bible and pray? How does one find time for this? What does Joseph Ellis mean when he says Washington “knew himself well enough to resist the illusion that he transcended his human nature?” Why is this knowledge significant or important in one’s life? Hard to believe it was forty years ago that humankind set foot on the moon. Wendy was kind enough to forward me a site where you can relive a bit of it at www.wechoosethemoon.com.